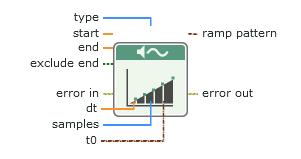 Generates a signal containing a ramp pattern of samples. Type of ramp to generate. Linear 0 Uses the linear type. Logarithmic 1 Uses the logarithmic type. A Boolean that determines whether to use the final value of the ramp to generate the ramp pattern. True Ignores the final value of the ramp when generating the ramp pattern. False Uses the final value of the ramp when generating the ramp pattern. Δ x = ( end − start ) m , m = n if exclude end? is True. Otherwise, m = n − 1 . Δ x = [ ln ( end ) − ln ( start ) ] m , m = n if exclude end? is True. Otherwise, m = n − 1 .
start and end must be greater than 0.